I’ve been living with OCD for 10years this summer. Every now and then I contemplate going to therapy, or doing something more proactive to help myself get better. Then my so called ‘logical/scientific’ brain kicks in and tells me I have valid reasons for concern over the issues I do, so getting better might actually be the wrong thing to do. Stupid, I know – but it’s true. As such I’ve been happy to sit back, take my pill every day, accept my OCD comes in cycles and that bad times with it will pass. Since starting my blog and my @girlwiththehat Twitter account, I’ve been interacting with lots of other people on their own mental health journey. Many of them are doing (or have done) proactive things to improve their situation. It’s helped me realise it’s time for me to do more. Whilst I’m not nearly ready for therapy I have begun to develop techniques that at least help make me mentally stronger and face my OCD rather than hiding away from it. I have only just started doing these techniques consciously (and I’m not always in the mood – I might be too tired, or it might be inappropriate) but I have noticed a difference already. It’s slight at the moment; but at least I’m starting to recognise the thoughts for what they are and that’s an important first step. These techniques aren’t cures. They’re not going to fix your OCD overnight. 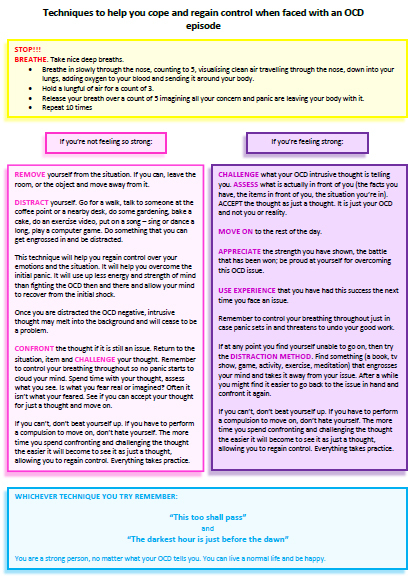 What they are, are coping strategies – things to have in the back of your mind to bring out to attack your OCD when confronted with an issue. Hopefully as you get used to them, they will become second nature and the OCD will catch you off guard less often. This way you can build up your strength against it and get to a point where you can take the next step – be it that therapy, reducing your medication, talking to others more about it. I thought I would share with you all the techniques I’ve found useful and I hope you find them helpful too. These are good techniques to follow. I especially like how you list specific things to do when you’re not feeling strong. Sometimes when we are in the middle of an episode and want to distract ourselves, it’s hard to think of anything to do. Thanks for sharing this!